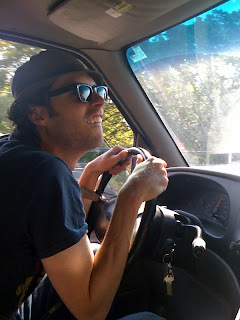 It's David's birthday and we're going to the beach for a long-deserved day off, so there's no time to be all creative--sun, surf and CORN SALAD await. 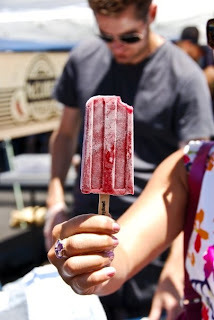 However, you can catch our sun-kissed, relaxed, ice-shavin' bods this weekend at the BROOKLYN FLEA in Ft. Greene on Saturday and in DUMBO on Sunday. It's true. Sugar Plum and Tarragon is here. The season's first batch of Sugar Plums. Here. Now. That paired with a tongue-twisting pinch of sweet tarragon and you've got yourself a pop that might cause a severe case of clothing malfunction. We'll be "falling out" tomorrow, July 25th at the Brooklyn Flea, Fort Greene. And on Sunday, July 26th in DUMBO, under the Brooklyn Bridge. Can't wait to see you therre. p.s. 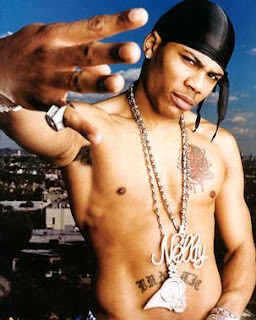 Just in case you think we're getting too gangsta for our britches, here's a picture of Joel whilin' out. He's going to hate me for putting this up at the end of a post he wrote. I wuv you, Joel Pole. Here's where we chop-chop crops into pops. 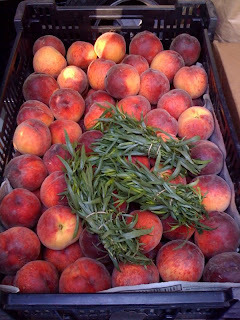 Flat-toppin' peaches and tarragon into cash crops of slop. Be-bop in the sweatshop nonstop nonstop. Egg in the glop (it's there to test Brix content) goes kerplop. A cop stops for pops. Is that snow in the backdrop??? I don't even know what this is, but I like it. In the workshop, apparently just got off the short-bus stop. In conclusion, boys and girls. The exhibit above exceeds, in terms of bop, pop and glop, the following: florist shops, belly flops, glottal stops, hunting crops, the Lindy hop, spinning tops and mutton chops. But hark, who's that fop in the backdrop? What's that coming out of his crop? 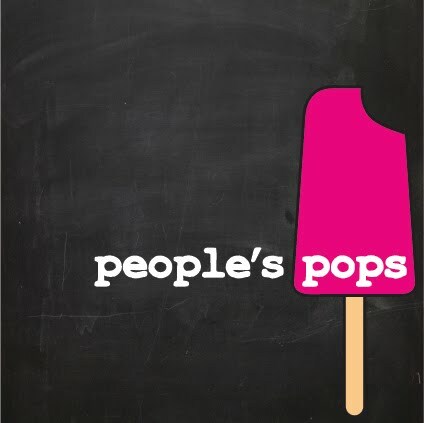 "Come and get your people's pop!!" Heed that fine barbaric yawp! War -- What Is It Good For? Nothing sells pops like a controversy. That’s why this morning’s am New York was as refreshing as a blueberry & cardamom pop at the Brooklyn Flea in Ft. Greene on July 11, 2009. While the article didn’t directly have anything to do with us, we decided that if the people’s pops wanted to be a player on the scene this summer, the people would immediately have to take a war footing. We can’t guarantee what flavors will be available at what location, but during this time of war you need to give us your complete trust and not ask any questions. Sour Cherry Is The New Red Coat...Just Tastier. Tommy J., AKA, Thomas Jefferson, to those of you who didn't actually know the guy, saw bright, seething red almost every waking moment of his life. 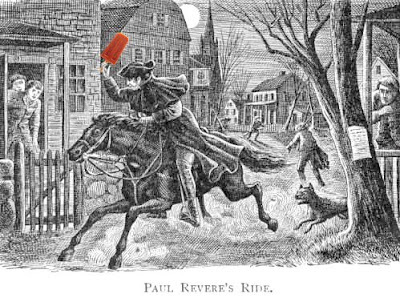 When he wasn't drafting the Declaration of Independence, acting as a Founding Father of the United States of America or organizing the Louisana Purchase, he was concentrating on one thing: Sour Cherry & Strawberry pops. Some say it was a pop that Tommy gave to Paul Revere that most aided his famed Midnight Ride, warning early Americans of an immenent British invasion. The story goes that British Troops uniforms were white, so Paul rode his horse really, really fast past them with an outstretched arm holding a Sour Cherry & Strawberry pop, rubbing it against their coats and giving them a red hue. Apparently, this is why the brightly colored British military eventually became known as the Red Coats. In any case, we're celebrating Independence Day this weekend with a line-up that could make any Founding Father a baby's daddy. Check us out on Saturday in Battery Park opposite 17 State Street and the Brooklyn Flea in Fort Greene, and on Sunday in DUMBO under the Brooklyn Bridge and at the GreenFlea in Manhattan on 77th and Columbus, our second-ever Manhattan appearance!! “No way,” I said. Cherries have burned us before. Last year at New Amsterdam, we bought $60 worth of cherries with which to make a shave ice syrup. Ben spent all afternoon pitting them, but as soon as we pureed the cherries, they turned an unappetizing shade of caca brown. Colin tried to save the day by suggesting we add cocoa as a scapegoat for color, and because cherries and chocolate pair so allegedly well, but the end result was still so gross that although we halfheartedly tried to sell it at a knock-down price as “The Experiment,” we gave up when we realized none of us actually liked it. At all. When Peter Hoffman says these things, you listen. You buy. You take the cherries to Coney Island where you cook, de-stem them (you forgot that that would take an hour), watch them ripple like expensive marbles as you pour them into a big jam pot, add some sugar and turn on the heat. He’s right. They turn a gorgeous ruby red and are piquant and full-flavored, nothing like the washed-out, wimpily saccharine hash sweet cherries grown in rainy weather make in the mouth. I’d figured that cherries cooked with sugar, like damsons, would burst and that the pits, buoyantly released, would float to the top. Boy, did I figure wrong. We ended up making only about half as many pops as usual. But they’re going rock out, I think. And I’m pretty sure we got every single pit out. If you happen to find one, you win a prize….oh god please don’t sue us. 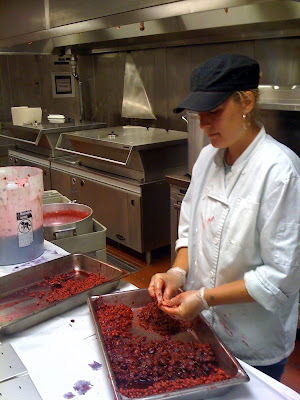 Still, it hit me today: I can’t believe I’m paying someone for the privilege of pitting cherries in their space. That’s math I can’t handle. Anybody for a $10 pop? 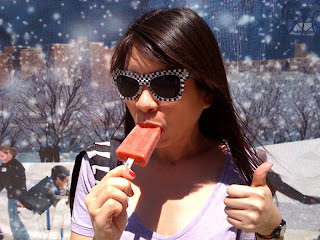 Pitsicle, anyone? ?